Sell your Samsung Galaxy Tab 10.1 P7500 with OnReycle and get the most money. We compare all major tablet recyclers in seconds. Samsung is one of the biggest consumer electronics companies in the world. They hold such a powerful reputation in South Korea (their home nation) that their influence can be seen in the country's politics, economic development, media and culture. Having their headquarters within 'Samsung Town' - an office park in Seoul, the Samsung name has become well-known in a variety of different industries since it started trading in 1938, including securities, insurance, textiles and food processing. Since the late 1960s, trading in the electronics industry has helped to grow the company around the world, and Samsung is now a household name in many countries. In order to remain popular, Samsung have constantly kept up to date with the latest technologies and ensured their products are regularly released, to maintain consumer attention. The ever-evolving range of Samsung smartphones and tablets is great for many consumers, but often results in older devices losing their value quickly. For owners of tablets such as the Samsung Galaxy Tab P7500, it can be frustrating, especially if they cannot afford a new model. However, there is a solution, and OnRecycle can provide this quickly and easily. OnRecycle provide consumers with a platform on which to sell their existing Samsung Galaxy Tab P7500, enabling them to fund a newer device. We link sellers with buyers via our easy-to-use website, giving both parties what they need. For you as a seller, we give you the best possible price for your Samsung Galaxy Tab P7500, without having the hassle of having to shop around to find quotations. Not only this, but we guarantee to provide quotations without taking any personal details from you - this ensures that you steer clear of any unwanted sales calls or emails. When you log on to OnRecycle, you will notice a search bar that appears at the top of each page. Simply enter the details of your Samsung Galaxy Tab P7500 into that bar, and a list of relevant products will appear in a dropdown box. Click on the one that best matches your Samsung Galaxy Tab P7500 and you will be taken to the next page. On this screen, we need to ask for a couple more details, so that we can match you to the right buyers and provide you with accurate quotations. Tell us the device's condition and the version that you wish to sell (for the Samsung Galaxy Tab P7500, you will choose between the 16, 32 and 64GB models). Once we have this information, the screen will refresh to provide you with the data you've been waiting for! When the table appears on screen, you might be overwhelmed by the quantity of information within it. Do not despair - this is all there to help you! We suggest that you pay particular attention to the 'payment' and the 'user ratings' fields. The user ratings give you a sense of the recycler's reputability. These ratings are calculated as a result of the number of complaints per 100 orders that the recycler has had - so, the higher the number of stars, the lower the number of complaints and therefore the greater the chance of you having a positive experience with them. We also recommend that you click on the 'view reviews' link below the stars, so that you can read up on your choice of recycler based on previous sellers' experiences. The 'payment' fields give you information on how quickly you will be paid by the recycler, and the method by which they will do so. This is vital if you are looking to sell your Samsung Galaxy Tab P7500 quickly. It is likely that you will choose someone who pays quickly, and in the preferred method for you (for example, have you factored in the time it takes to receive a cheque and wait for it to clear?). The other field we are sure you will check is the 'price' column: it is only natural for you to want a fair price to match the value of your Samsung Galaxy Tab P7500. When you have chosen a recycler, you are ready to sell your Samsung Galaxy Tab P7500. Click on the 'sell now' button and follow the remaining steps to part with your device, and receive payment. If you are given the option of selling through OnRecycle, we recommend you do this so that you can benefit from our expert advice whilst providing your details through a safe and secure payment system. 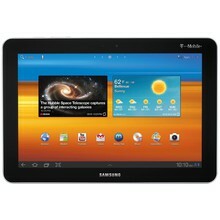 Having sold your Samsung Galaxy Tab P7500, you are now in a position to look around for new tablet devices. It might be worth reading our brief review of the device you have just sold, so that you have something to compare future purchases with. The P7500 Tab was released in 2011. It has dimensions of 256.7 x 175.3 x 8.6mm and weighs just 565 grams. The size and weight of the unit makes it a good tablet for watching videos, playing games and generally browsing the internet. It is also light enough to be easily transported. The P7500 Tab 10.1 - as the name suggests - has a 10.1-inch display with a resolution of 800 x 1280 pixels and described as a 'PLS TFT capacitive touchscreen.' The display makes it enjoyable to view photos taken through the device's 3.15 megapixel camera and 2 megapixel secondary lens. Available in either 16, 32 or 64GB models, there is sure to be a model of P7500 Tab that suits every user and budget. Each one has 1GB of RAM, and the device comes with Android 3.1 (Honeycomb) operating system. The P7500 Tab plays MP3 and MP4 files, and the battery has up to 1840 hours of standby time (with 3G) and up to 9 hours of talk time.